You’re a smooth operator. Organization is your middle name. And you juggle more projects than Kim Kardashian posts Instagram selfies. Sure, you’ve got the right secretary qualifications. You’re capable of much more than answering the phones and collecting the mail. But do you know how to write a secretary resume that will actually get you the job? With many secretary positions requiring no formal education, there’s a lot of competition for these roles. So, how do you stand out from the crowd and get noticed by the hiring manager? You need a professional secretary resume that multitasks as well as, well, you! A resume that showcases you as a highly-skilled professional. One that shows how you communicate, organize and manage tasks with flair. It’s easier than you think to write the best secretary resume by creating a template that you can tailor to any secretary job description. A secretary resume example better than 9 out of 10 other resumes. How to write a secretary resume that will land you more interviews. Tips and examples of how to put skills and achievements on a secretary resume. How to describe your experience on a resume for a secretary to get any job you want. Here's a free sample resume for a secretary made using our resume builder. Secretary Resume Examples - See more templates and create your resume here. What's the Best Format for a Secretary Resume? You’re at the heart of the organization, so you need a certain level of professionalism. Your secretary resume needs to reflect this and be polished, to-the-point and professional. With the right format. For administrative secretary resumes, that means the tried-and-tested reverse-chronological resume format. Many of these positions are in big firms or multinational corporations. It’s best to stick with the secretary resume format that recruiters are familiar with. Remember, many corporate firms you’re applying to may be using Applicant Tracking Systems (ATS). According to the Jobvite Recruiter Nation Report 2016, 41% of recruiters are now using these. Chances are your office secretary resume will be scanned by tiny robots for keywords such as typing skills and who your favourite character on Game of Thrones is (okay, kidding about that one). The reverse-chronological format is the easiest for the robots to scan and find the different sections of your resume. The reverse-chronological format also highlights your office skills and secretary experience. This will give you an edge over entry-level applicants and recent grads. But what if you’re writing an entry-level secretary resume and you have no specific experience? Fear not! In this instance, lead with your education. It shows a commitment and ability to manage tasks and deadlines. You can also mention relevant work experience that's not directly related to a secretarial role here. Imagine for a second that you’ve been working part-time at your local cafe. You run the weekly staff meeting like a boss and record the meeting notes. That’s a transferable skill that you can highlight in your work experience section. 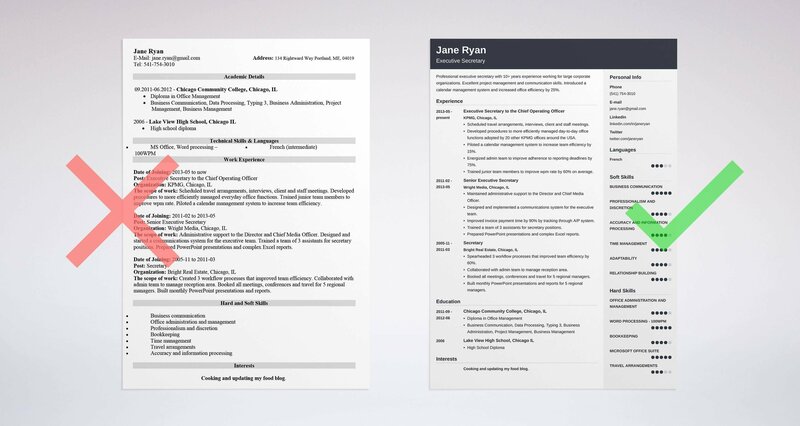 Pro Tip: Keep the formatting of your resume clean and simple to make it feel professional. Step away from the Comic Sans. Use easy-to-read fonts like Arial, Helvetica, Calibri, and Verdana. 10-12 points are the magic numbers for font size. Not entirely sure about the reverse-chronological format for your secretary resume? See our guide: "3 Resume Formats: How to Choose the Best One [Examples]"
Secretary: Resume Summary or Career Objective? Think about this for a moment. How many times are you guilty of skimming over an unnecessarily long work email? Well, spare a thought for recruiters. They’re faced with piles of resumes every day, some interesting, some not so much. So it should come as no surprise that according to TheLadders, recruiters take an average of six seconds to scan a resume. So, how do you grab their attention in those six seconds? Easy! You lead with a secretarial resume objective or a professional resume summary. Let’s imagine for a second that you have 10+ years’ experience as an executive secretary in a large multinational corporation. If you’ve spent your career in administrative or secretarial roles, then this one’s for you. You’ve got the necessary skills and experience, so here’s where you sell yourself. Remember to keep it short and sweet. Three sentences are enough. Perhaps you’re a fresh graduate entering the workforce for the first time. Or you’re a bartender who’s had enough of managing tipsy customers and you want to manage an office instead. The resume objective is the best option for entry-level secretary resumes or career changers. Use it to show that your abilities, goals and objectives fit what the prospective employer is looking for, even if you don’t have the traditional experience. Professional, efficient secretary with 6+ years experience working for a large corporate organization. Excellent project management, organization and communication skills. Introduced a time management system and increased the efficiency of the office by 15%. Promoted to executive secretary in 2015. I am a secretary with 2 years’ experience working in an office. I am seeking a job in a corporate environment where I can learn and develop my skills. Your secretary resume summary should match your achievements and skills to the role requirements. Avoid a vague description of the role you’re looking for. Dynamic college graduate with excellent communication skills seeks school secretarial role. Excellent initiative and project management skills developed over the course of my degree. Ready to use organizational skills to provide administrative support to your team. For starters, you should avoid highlighting the fact you have no experience at the top of your resume. Also, avoid saying what you want. Remember, the employer is more interested in what they want at this stage in the game. For your entry-level secretary resume objective, choose soft skills (more on these later). Communication skills or attention to detail are great examples of this. These aren’t necessarily specific to a secretary job description, but they are still skills needed for the role. You may have developed these soft skills during your education or part-time job experience. 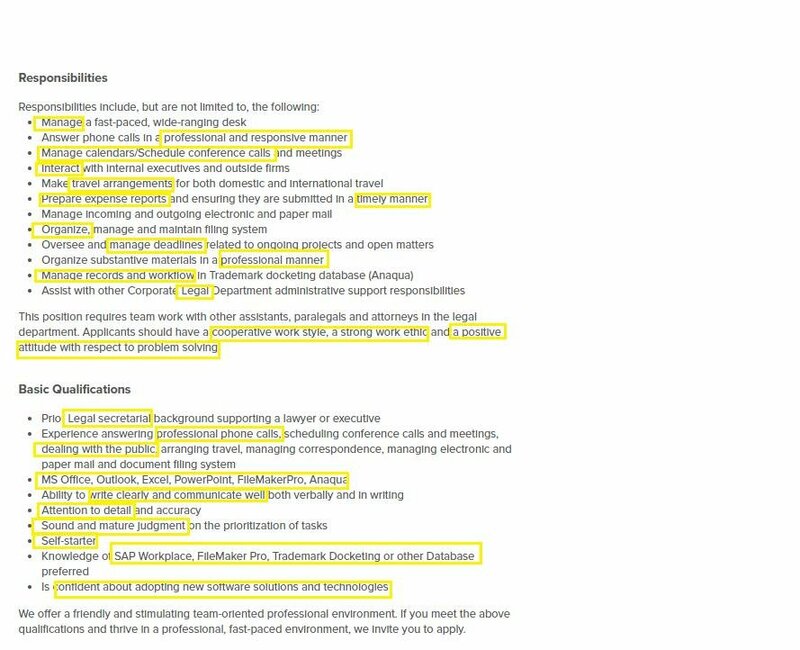 Pro Tip: Take a close look at the job posting and highlight the specific skills it mentions. Ensure you include the ones relevant to you in your resume summary. Want more tips on writing an impressive resume summary? Or feeling a little nervous writing your first-ever secretary resume objective? Our guides will help: “How to Write a Resume Summary: 21 Best Examples You Will See” AND “+20 Resume Objective Examples - Use Them on Your Resume (Tips)”. You’ve got the office skills, phone skills, typing skills, the whole shebang. Don’t miss your opportunity to show, not tell, the hiring manager that you’re right for the job. Do it early, underneath your resume summary. In your resume, list your secretary duties under each job in reverse-chronological order. Include up to six bullet points that match the skills in the job description. Include key achievements, backed up by tangible examples. Let’s look at the experience section from a school secretary resume sample, based on this job description. Guided substitute teachers and facilitated assignment availability. Consulted with parents and pioneered a new system for managing their inquiries. Increased parent satisfaction by 35%. Acted as front desk receptionist. Responsible for booking the principal’s appointments. Responsible for typing and proofreading documents. Do you see the difference? Instead of simply listing responsibilities, the school secretary resume sample lists achievements, complemented by quantifiable results. The first example also contains action words, which are much stronger than the passive-sounding “responsible for” and boring “managed”. Use the PAR (Problem Action Result) approach when listing your professional achievements. Problem: Parents were frustrated with an inefficient system of managing their inquiries. Action: Consulted with them about why they were frustrated and created a new system which addressed these concerns. Result: Parent satisfaction increased by 35% in next school survey. What if you’re writing a secretary resume with no experience? No worries. You just have to be a little more creative in your experience section. Guided new staff and provided training and materials to them. Implemented a new customer feedback system which increased customer satisfaction by 45%. Negotiated with a coffee vendor to lower the cost of coffee when purchased in bulk. The barista has mentioned duties she performed at the coffee house which relate to the secretary duties in the job description. She has also included soft skills such as communication by showing how she negotiated with the coffee vendor and trained new staff. Pro Tip: Ditch overused buzzwords and phrases like “managed”, “responsible for” and “led”. Spice up your resume for a secretary position with powerful action verbs to make the hiring manager take notice. Want a full list of action words to make your secretary resume pop? Check out our guide “+80 Examples of Resume Action Words for Every Profession”. Think the hiring manager doesn’t care if you have any education qualifications? Well, you could be wrong there. It all depends on what kind of secretary job you’re applying for. Let’s say you’re writing a resume for a specialized secretary position. It might be a legal secretary resume or a medical secretary resume. In both cases, you will have completed secretary qualifications and skills training. You’ll want to showcase these to the hiring manager, right after your experience section. When you’ve been performing legal secretary tasks like a seasoned pro for years, your experience is more relevant at this point. Add the right qualifications and you’ve got yourself a double whammy that proves you’re the right person for the job. Start with your most specific and relevant education first. Then follow it up with any other qualifications - you can be less detailed with those. What if you’re writing an entry-level secretary resume as a bright-eyed recent graduate or while still completing your studies? Your resume should showcase your education first, above your experience section. Use this prime real estate at the top of your professional secretary resume template to show your best accomplishments first. This will also set you apart from other applicants. Didn’t finish high school or college? No drama. You can still include what you did complete. Pro Tip: Have you got any other interesting education qualifications under your belt, such as another language, communication or project management course? Include these. They show the hiring manager you’re committed to furthering your own education and improving yourself. Are you writing a medical secretary resume or school secretary resume? Or just want more examples of how you should include your education in your executive secretary resume? Our guide “How to Put Your Education on a Resume [Tips & Examples]” has more handy tips and tricks. Picture this. It’s now 3.30pm and Karen, the hiring manager, yawns as she she reaches for your executive secretary resume, while mentally planning her next vacation. Your resume better grab her attention and show her quickly that you’ve got sharp administration skills that deserve that secretary job salary. So, which of your secretarial skills should your resume highlight? Here’s an example of how to put skills like WPM (words per minute) and typing skills on your secretary resume. First, go through the job description and circle all the skills you see. Now it’s time to tailor your resume skills to the secretary job description. This will allow the hiring manager to easily match your profile to what they are looking for. Your skills can be separated into two groups: hard and soft. Hard skills are not like that math problem you could never answer at school (or was that just me?). These are the technical skills and abilities required to be able to complete the job. This is also where you include any relevant skills required for a legal or medical secretary resume. Soft resume skills are a little harder to put your finger on - they are the qualities not specific to the job itself. They are transferable. They relate to your social skills and emotional intelligence, such as your ability to work well with others and be calm under pressure. Here you can see how to put hard skills like WPM or answering phones on your resume, and complement them with relevant soft skills. Make sure your resume includes enough detail to paint a picture of how your skills match the job description. For example, don’t just say you have “communication skills”. Explain and develop why you’re a good communicator. Did you notice something about the example? We’ve listed more soft secretary skills than hard office skills. This is because most companies look for people who will be a great cultural fit ahead of anything else. In fact, according to CareerBuilder, 62% of employers are now specifically looking for your soft skills in your resume. Pro Tip: You might have a relevant skill that’s not mentioned in the job description, but by all means, include it in your resume! Check out other similar job listings to see what kind of skills other companies are looking for. You’re a typing wizard who can tap out 100 WPM? Put it on your resume! Are you bilingual? Mastery of two languages shows you’re dedicated - don’t leave bilingual skills off! Want some more examples of the types of skills you can include in your secretary resume? Check out our guide: +30 Best Examples of What Skills to Put on a Resume (Proven Tips). Were you the one who ran your club meetings in college? Do you volunteer your time helping out at the local library or animal shelter? At first glance, these might not seem to relate to traditional secretary resume duties. In fact, they are actually activities where you rely on qualities needed for the key responsibilities of a secretary. I’m sure you have a few hobbies, too. You may want to include some of these to showcase a bit more of your personality. Don’t forget, a lot of companies recruit based on soft skills and cultural fit. Research the company culture to see if they would find your personal interests valuable. Be sure to only mention outside interests that are relevant to the company’s culture or position. I volunteer reading to kids at the library on Saturdays. I am interested in other cultures and am currently learning French. I’m a night owl and I love staying up late watching movies. The first two examples are perfect for a school secretary resume. These show that the person likes being with children and has an interest in learning. The other two are irrelevant and may give the impression that the person is not mature enough for the role. Pro Tip: Don’t go overboard and list everything in this section - a couple of examples are enough. You don’t want to seem like you won’t have the time to be able to devote your full attention to your new secretary position! Need more examples of hobbies for your secretary resume? Do you even need to add an extra section? Read our guide “+20 Best Examples of Hobbies & Interests to Put on a Resume (5 Tips)”. With your snazzy new secretary resume showcasing your skills, you don’t need to bother with a cover letter as well, right? You put all that hard work into crafting the best secretary resume template, but there’s one reason it might not even get looked at. A 2016 survey by Careerbuilder revealed that 45% of recruiters will reject your secretarial resume if it doesn’t have one. Far better to be safe than sorry, right? Plus, a great secretary cover letter might just be the ticket to elevate your resume above the rest. Introduce yourself, and make yourself memorable. Explain why you’re interested in the secretary position. Show why you’re the best person for the job. Explain reasons for any career changes or job hopping. Give reasons for gaps in your work experience. Anticipate answers to secretary job interview questions. To write a secretary application letter that sparkles, show a bit of your personality. Secretaries have to be relatable to a range of people from the CEO to the mail delivery guy, so let your cover letter show you can do that. Most importantly, don’t forget to tailor it to the job description. For example, if you’re writing a letter of interest for a medical secretary resume or a litigation secretary resume, these will each need to be different. Pro Tip: Do your research and find a few different sample cover letters for secretary or administrative job descriptions. See how others are introducing themselves and what kind of tone they adopt in their cover letter. You’re the master of multitasking, and let’s be honest - the place would fall apart without you! Open your secretary resume with a resume objective or a resume summary. In your work experience section, highlight your achievements. Match your skills section to the skills listed in the job ad. Add "other" sections that will reiterate your value. Do this and you’ll be nailing that dream role in no time at all. Got any questions? Want to chat about writing your resume? Give us a shout in the comments and we'll get back to you asap! 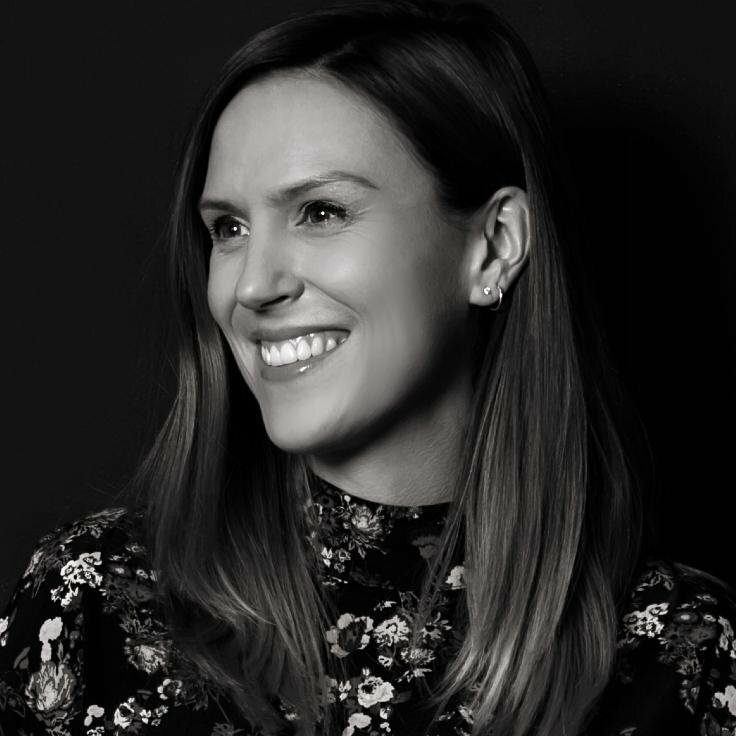 Natalie Cosgrove is a freelance writer and editor from New Zealand who specializes in lifestyle, business and social content. As a travel lover and digital nomad, she has previously lived in Malaysia and Australia, and is currently based in Warsaw, Poland. In her spare time you can find her exploring her new city and eating all of the pierogi.